What time is it? 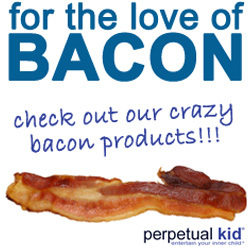 Time for you to get a bacon watch! Where else but at Archie McPhee. The irresistible allure of bacon has crossed over into the world of fashion! Each watch has straps that look like delicious slices of bacon. Vinyl strap, metal casing. Batteries included. Fits most adult wrists. $24.95 ea. Oh so awesome! and who doesn't love love love Archie McPhee's?